At least this little guy (or gal) did! Mrs. Frog and I were at a great museum that exceeded expectations – the Roanoke Island Festival Park in Manteo, NC. There’s a recreation of a 16th century sailing ship, exhibits of the Native American inhabitants of the area, and interactive exhibits of the early settlements, among other things. You know how sometimes you go to a museum with reservations (about going – not a scheduled time)? I went in with a little bit of that attitude, and left with a different view. This was well worth it, at least to us. Anyway, besides all of the history stuff, there are friendly little critters running around the grounds. Like squirrels. This guy/gal wasn’t the least bit bothered by the big two-legged things that invaded its’ home. Indeed, it was quite content to have what appeared to be a mini-Ritz cracker or two. As you can see, I was right there with my Icon as the cracker was carefully rotated and consumed. As I’m sitting here typing this, I’m thinking to myself that this would have made an entertaining short video. Maybe next time. A couple of different images from this impromptu wildlife shoot will end up in the “peaceful (for the most part) critters” gallery on Laughing Frog Images. Wander on in and check it out. And maybe create a coffee mug or something else for yourself while you’re in there. We have several feeders just outside of the kitchen table for our winged friends – suet, socks for the finches, and mixed seed for the masses. The feeders serve as entertainment for the cats, and, I have to admit, me and my camera as well. Occasionally, the birds are messy. Don’t know if it’s because they are digging for that special seed or what – the birds don’t say much to me. 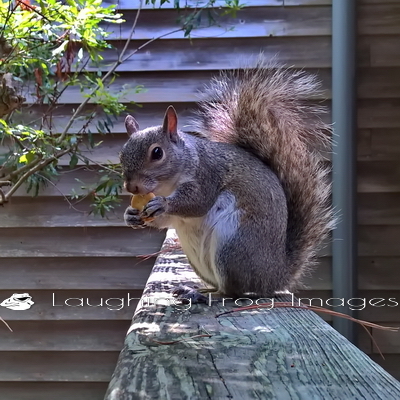 However, when the birds are messy, someone else is happy – and that’s the squirrels. The birds’ mess means that they don’t have to do much to dine – they just have to show up. Here’s Ethel posing for the camera while she takes a break from breakfast. Actually, I can’t tell you if Ethel is a he or a she, but there’s a story behind the name that the guy’s might appreciate. 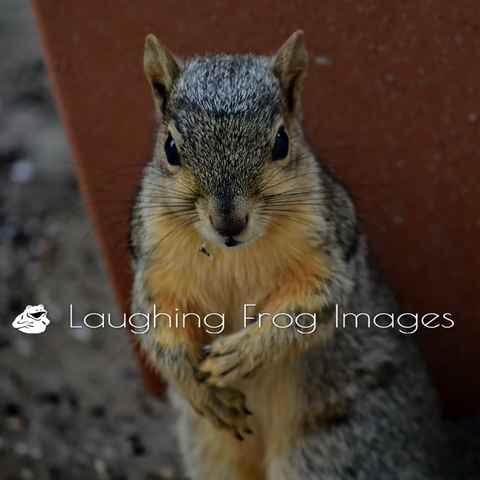 This image of Ethel has been added to the “peaceful (for the most part) critters” gallery on Laughing Frog Images. Look for more of Fred and Ethel to be added over time. Wander on into the image galleries on Laughing Frog Images for a while and take a break from reality, and who knows, get something for yourself or for someone who deserves something unique and different.